The lovely little town of Thorpeness has a wonderfully magical feel. Visitors will be impressed with the village's creatively disguised water tower, The House in The Clouds. Fans of Peter Pan will want to see the Meare boating lake where islands and coves are named after the characters from the story, and a picnic followed by a trip on the Thorpeness Boating Lake makes for a great family day out. Thorpeness is a great place for children of all ages, and also for those of you who, like Peter Pan, will never grow up! For more information on this enchanting town, please see our guide to Thorpeness. Thorpeness Hotel, Apartments & Golf Club is a truly unique establishment offering a vast number of services all in one location. The 3 star Thorpeness Hotel is situated in a peaceful location next to the Meare, and offers 36 rooms with fantastic views of the Meare, the House in the Clouds, the beautiful gardens or the golf course. There are 12 self-catering apartments, each sleeping between 10 and 12 guests at a time, just five minutes from Thorpeness Beach. All are fully equipped to make your stay as comfortable as possible, and make ideal accommodation for large families or group holidays. Visitors may enjoy traditional British fare in the Thorpeness restaurant for breakfast and dinner whilst watching other guests play golf - if you intend to play a round later in the day, this is the ideal spot from which to gain a few tips or to check out the competition! 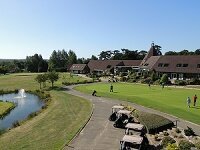 The 18-hole golf course is set amongst the Suffolk coastal heath land, and offers a challenge for players of all abilities. Golf tuition is available, and the course makes for a fun family activity, a great way to unwind, and also a unique corporate or society pursuit. Also on the grounds are 7 tennis courts and eye-catching landscaped gardens. Finally, the Thorpeness Country Club makes an ideal venue for your wedding, and the hotel is licensed to host wedding ceremonies and will help you plan your perfect day from start to finish. So what are you waiting for! Click on the link above for more details and to make a reservation today!